Way back in the annals of guitar playing history, one company shaped the future of guitar effects pedals, Boss in Japan were the Mayflower travelling forefathers of the stompbox. In more recent times we have seen a notable rise in the ’boutique’ pedal market which the bigger corporations have had to learn keep up with and given the difficulty in releasing vast swathes of pedals to the public, the boutique market is an easer outlet to release small numbers to see if the public take to them. Boss have a mantra that states that they should ‘always move forward’ and while this is very true in the hi-tech world, us guitarists are very fond of old gear, the classic’s such as the DS-1 Distortion, SD-1 Super Overdrive, BD-2 Blues Driver, CE-2 Chorus are a small handful of legendary pedals that keep reappearing on pedal boards some thirty years after they were initially released a long time ago. So Boss recently chose to revisit their back catalogue to see if they could make any improvements, creating a Boss custom shop under the name of Waza Craft. The Boss SD-1 was released way back in 1981 and has been a mainstay for the likes of The Edge, Zakk Wylde and Johnny Greenwood giving them the drive they needed to push the front end of their amps. The Boss SD-1 is primarily used for just that, the extra drive into an already driven channel gives players the soaring lead tone from classic rock all the way up the emotive crashing solo tones in Radiohead. The way the pedal works is that it drives outer boundaries of the guitar signal but leaves the core of the signal clean and dry, when played into a driven amp the pedal gives more gain but still drives the amp in the same way as expected, a cunning idea. Modern rock music has placed fresh demands on these classic pedals, so Boss has tasked the Waza Craft team to implement these changes into a handful of initial pedals, the first being the SD-1W. The new Boss Waza Craft SD-1W custom circuit is significantly warmer sounding but also handles a noticeable increase in gain which is great for modern rock playing, it’s possible to get quite weighty tones out of only a smattering of drive from the amp channel. A really important factor that Boss had to get right was the body of the tone, a lot of drive pedals can suffer from having a ‘U’ shaped graphic equaliser tone, missing the body of the guitars tone which is largely frequencies in the mid range. 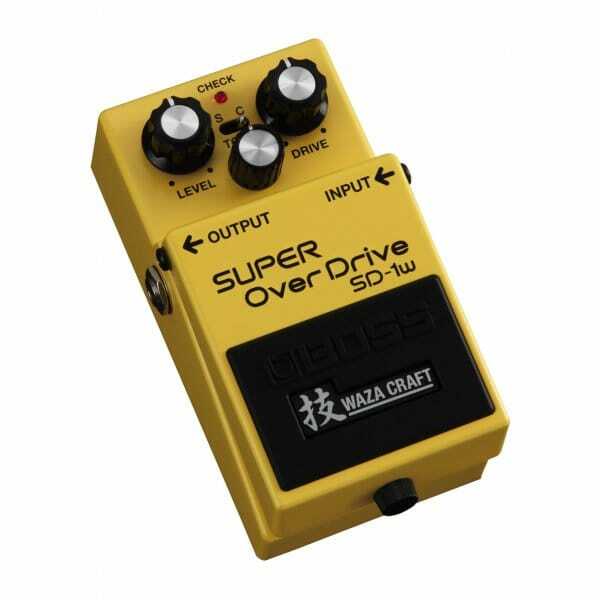 The Boss Waza Craft SD-1W nails this aspect, if this was a ’boutique’ pedal it would probably cost twice the price. Boss have done a really good thing creating the Waza Craft range and these will surely resonate within the huge collection of pedal enthusiasts. There is also the option, by way of a micro switch on the panel, to switch between the classic tone and custom tone from the Waza Craft modification.